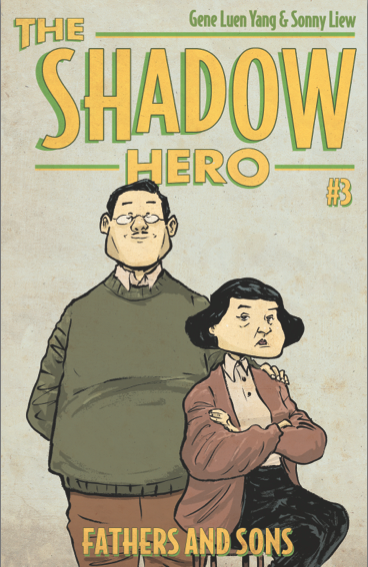 A look at the third issue of Gene Luen Yang and Sonny Liew's fascinating comic The Shadow Hero! 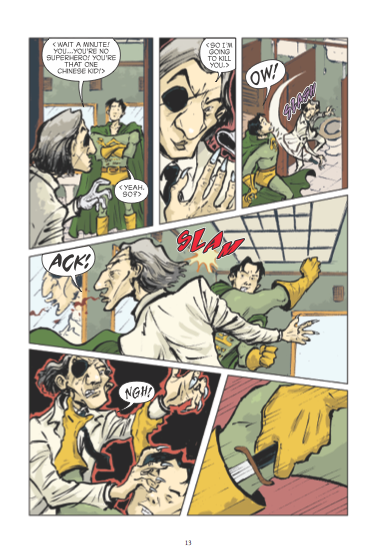 We last left off in issue 2 with Hank having gone on his first outing as a superhero, rather unsuccessfully. There was some nice hints at a deeper history in the character of Hank's father that Kyle mentioned were hopefully going to be fleshed out in the third issue. Indeed they are: this issue fleshes out the story behind the "criminal" that Hua accuses Hank's father of hiding from, showing us that the family is secretly paying off the local crime lord, Mock Beak. Because he was distracted in his tending to Hank's wounds from the last issue, Hank's father forgot to pay his weekly sum to the gangsters, so they come looking for payback, stealing a literal family jewel. Hank learns more about the history of Mock Beak and his gang, and after seeing the superhero Anchor of Justice flying by with a criminal in tow, he is inspired to take back his father's jade pendant. This adventure goes much better than the first, and plays out like a classic Batman comic in many ways, including tragic ones as Mock Beak retaliates. 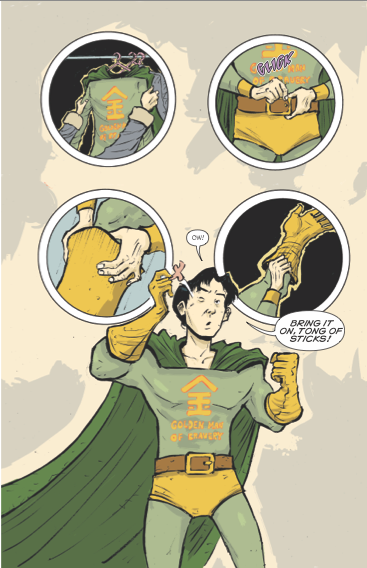 In the end, the mythical Eastern elements that have been hinted at since the first issue come back into play in a way that ensures the next issue could be very thrilling. Yang is putting together a superhero story that is unique in its setting, characters, and culture and yet falls gracefully into a classic storytelling mold. This issue hearkens back very nicely to crime and vigilante pulp comics, and while the story of a lowly grocer being tormented by evil gangsters is not an entirely new one, it is played up with great emotional resonance. The story has fun action and cartoonish moments like issue two, but manages to bring a sense of drama that hadn't been delved into too deeply previously. It's a great setup for an epic tale, but manages to keep the story very personal. Hank and his family feel quite real, both in terms of their personalities and their motivations. Hua is moved by boredom, a disappointment in how dull her life in America became, ready to give her son a life of adventure, excitement, and bravery. Hank's primary motivation is in his family; he has an immense respect for his father, and with the right push from his mother it feels right for him to don a silly costume and seek vengeance. Liew's art here is fantastic, and is particularly impressive in how it portrays roadrunner style cartoony running, hand-to-hand combat, and gravely serious moments with equal talent while managing to give the whole thing a very fluid feel. The coloring is wonderful in its muted tones and smart outlining which really highlights the drama in a few intense scenes. The facial and body acting is really nice and expressive, and the restraint in the fairly standard panel layouts works to make the more visually unique layouts stand out even more. So far, Yang and Liew have given us something really unique and wonderful here. 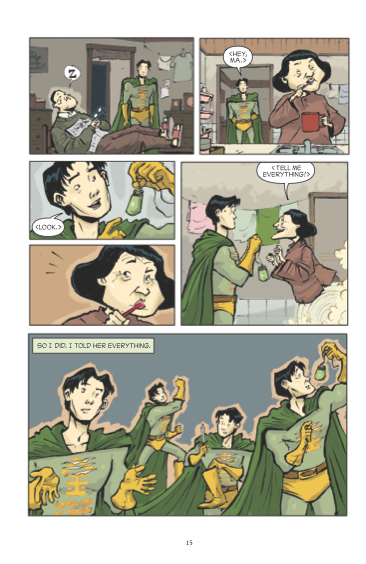 This is a story that has the same fascinating cultural background of Yang's books like American Born Chinese but with the really intriguing addition of American comic book history. This is a highly recommended read! You can check out all the issues of The Shadow Hero digitally from Amazon with the entire graphic novel coming out in print from First Second Books in July!